Most pests won't bother your succulent plants; they can't get through the tough skin and waxy coating on some species, and other types just don't taste right. 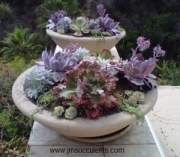 As a group, succulent plants don't seem susceptible to many bugs or diseases. Don't get complacent though - intense scrutiny will catch any problems while they're still small. If you're in the age bracket that I am, sometimes you need help seeing some of these pests - I take succulent pictures, which I can zoom in on to see the culprits. Insect identification is an important factor when you need to take steps to control them. 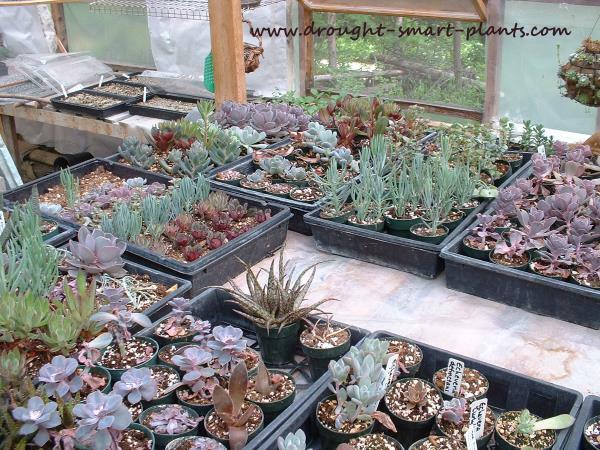 Keeping the basic needs of succulent plants in mind - infrequent but thorough watering, bright light - will eliminate most diseases such as root rot or pests like fungus gnats, as they require moist soil at all times to grow. Use pots that have good drain holes; my favorite pots are terracotta clay pots as they are heavy enough not to topple over when the soil dries out and also permit air exchange through the sides of the pot. 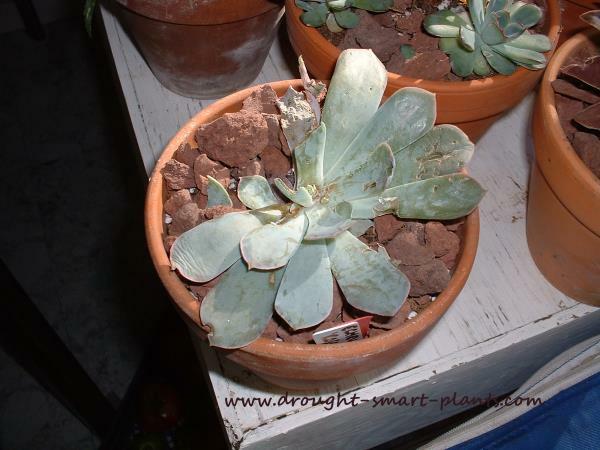 Visit this page for more information on how to grow Echeveria and other succulent plants. For more pest control ideas see this page. 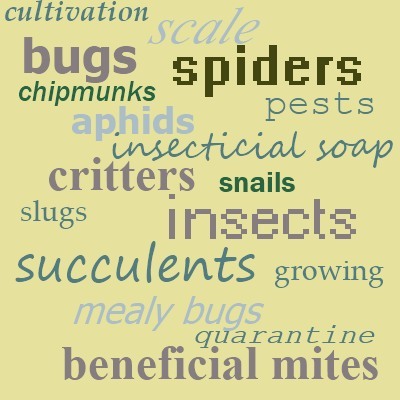 Luckily, succulents don't have many pests, apart from the few four legged critters that like the way they taste. The odd aphid infestation, or mealy bugs are usually easy to take care of if caught early - constant vigilance, and early treatment are the watchwords. Getting new plants can be so exciting that you can't wait to see what they look like in your display. However, when you get a new plant, resist the urge to put it right in amongst the rest of your collection. I usually quarantine a new plant for at least a couple of weeks, inspecting frequently in case it has a pest for a hitchhiker. Inspect your plants daily if possible, or at least weekly. Mealy bugs occasionally rear their ugly heads, but a watchful eye on the growers part can nip that in the bud. Check deep down in the crown of the plant, and where the leaf attaches to the stem. Use a cotton swab with rubbing alcohol to remove them, or use a diluted mixture of Safer's insecticidal soap in tepid water. 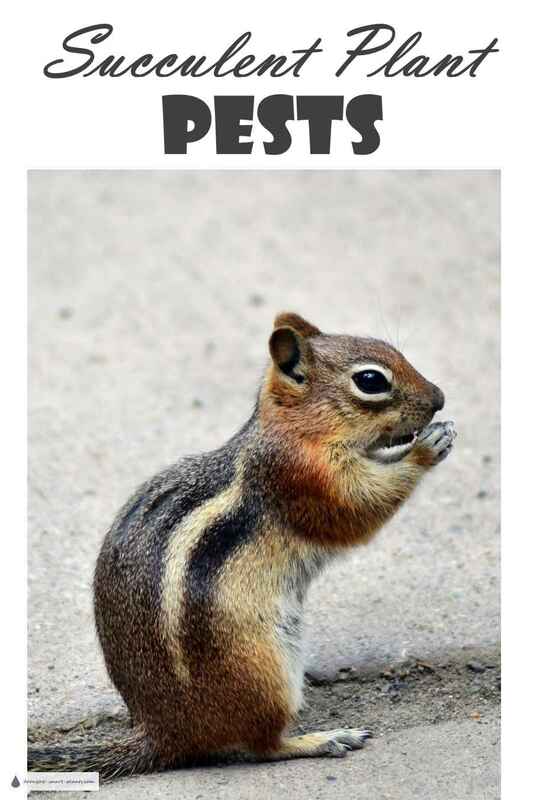 For really stubborn infestations, add a tiny amount - a few drops is sufficient - of cooking oil to the insecticidal soap - this ensures that the insects protective waxy coating is covered and they smother. Be warned; the protective waxy coating called 'bloom' will be destroyed by the fatty acids in soap, which may be unsightly temporarily - not to worry, these plants will replace it in time. The damage mealy bugs cause will often show as pale and stunted new growth in the crown of the plant. Some species of mealy bug will attack the roots of your plants - especially in plastic pots, with peat based soils - yet another great reason to use a sand or pumice based potting medium. Typically, the telltale signs are white mold looking stuff on the outside of the root ball where it's been against the pot. Treatment consists of removing as much soil as possible, and dipping the plant into warm water at a temperature of around 160 degrees Fahrenheit. Repot into clean soil, and discard the infected soil by burning it, or sending it to the landfill. It's not worth the risk to reuse it. Aphids can be a serious pest if not caught soon enough. 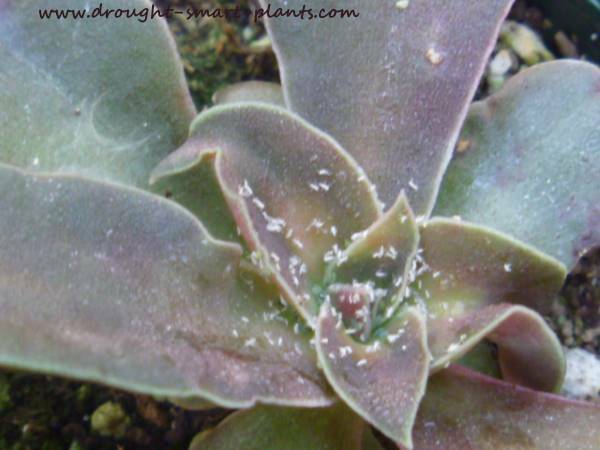 Not only can they stunt the growth of succulents, especially Echeveria, they can carry a virus from plant to plant. They can be a major problem with Sempervivum - watch for wasp activity and look closely at the crowns of the plant. Use very mild insecticidal soap, or simply a strong spray of plain water. Soap or other chemicals can remove the 'bloom' or waxy protective coating from the leaves of many Echeveria and other succulents, so use caution. Watch for slugs or snails during rainy periods. Keeping the pots above ground if they're in containers will help, and use a gritty mulch such as lava rock as the soft bodies of the slugs prevent them from crossing it. Pay close attention when you bring succulent plants in for the winter after a summer outdoors - particularly in the drainage holes of containers and pots. 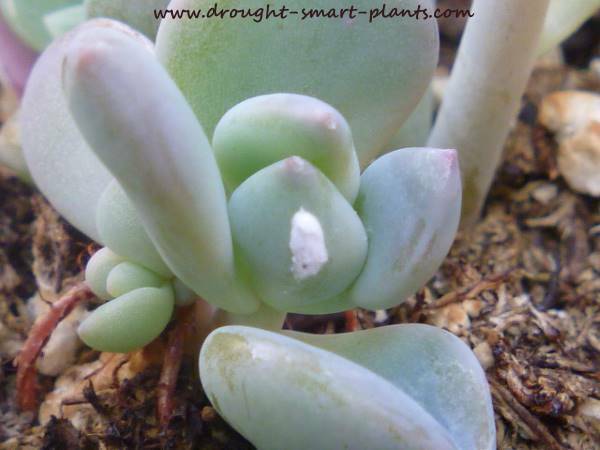 Not sure what you should be doing when bringing your tender succulents indoors for the winter? The worst pests I encounter in my greenhouse are chipmunks! In the late summer as they look around for a comfy winter home or nice succulent juicy leaves to store, they try and use the greenhouse. This is usually only a short lived problem as long as you don't let them settle in, but overnight they can take a gorgeous big succulent plant such as this Echeveria and nibble it into ribbons. Strangely enough, the little varmint had piled up all his loot and came back over the following few nights to carry it off to store it. I never did catch him, but I moved all my plants inside that day to foil him! Learn more tactics to keep your garden pests under control. Luckily for us, most succulent plants are resilient, and will bounce back from what looks like total devastation. Don't be too quick to write off a plant that has a pest problem. If you have mealy bugs or other insect damage, take some leaves or cuttings right away and propagate them. Inspect them closely to make sure you're not propagating the problem too. I routinely take some cuttings as soon as I get a new plant - there's no point losing new stock by hesitating to spoil the way it looks. In most cases, you can almost decimate a plant by taking the lower leaves off, and within a few weeks to months you can't even tell. Sometimes you'll get a plant with withered leaves at the bottom which should be taken off anyway, so just take the next few for propagating. I sometimes go so far as to behead a new succulent plant - this gives me a nice new rosette, as well as encouraging new smaller rosettes to form on the stem.